GUNNY’S ROAD — Betty Ermey, daughter of Marine drill Sgt. R. Lee Ermey, and Charles F. Bostwick, field representative for Los Angeles County 5th District Supervisor Kathryn Barger, show off the new sign for R. Lee Ermey Boulevard during a ceremony Saturday. NEW NAME — Ric Norris, president of the Palmdale Hospital Foundation, speaks Saturday at ceremonies adding the name R. Lee Ermey Boulevard to Avenue N.
The Young Marines of the Antelope Valley were among the participants Saturday in a ceremony adding the name R. Lee Ermey Boulevard to Avenue N.
It was a ceremony and event fitting for the 243rd birthday of the Marine Corps. Numerous dignitaries from around the Antelope Valley turned out Saturday at the noted site on Sierra Highway where aviation enthusiasts often gather to watch planes take off from nearby Plant 42 — a place affectionately known as B.J.’s Corner. 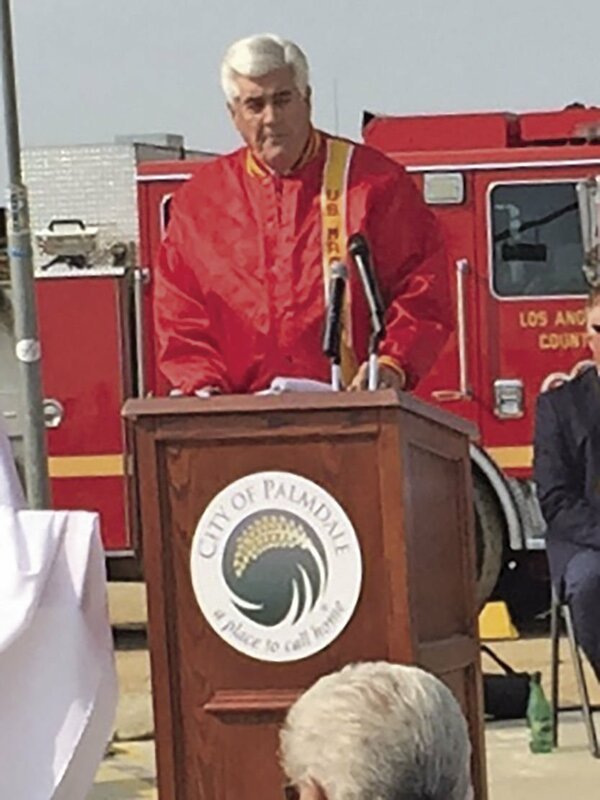 Ermey, who was a real-life Marine drill instructor, actor, military ambassador and longtime resident of the Antelope Valley, also was well known for his charitable work in support of the Marine Corps, military programs, veterans and others. Ermey died in April at age 74. Among those in attendance were Rep. Steve Knight, R-Palmdale; Donna Hill, representing State Sen. Scott Wilk; Assemblyman Tom Lackey; Palmdale mayor-elect Steve Hofbauer; Charles F. Bostwick, representing Los Angeles County 5th District Su­per­visor Kath­er­ine Bar­ger; Austin Bish­op; Juan Carillo; coun­­cil­­member Laura Bet­tan­court; and City Manager Jim Purtee. Also in attendance were the Young Marines from the Antelope Valley, Santa Clarita Valley and Quartz Hill, as well as a chapter from Downey. The county Fire Department had a heli­copter fly over the proceedings. 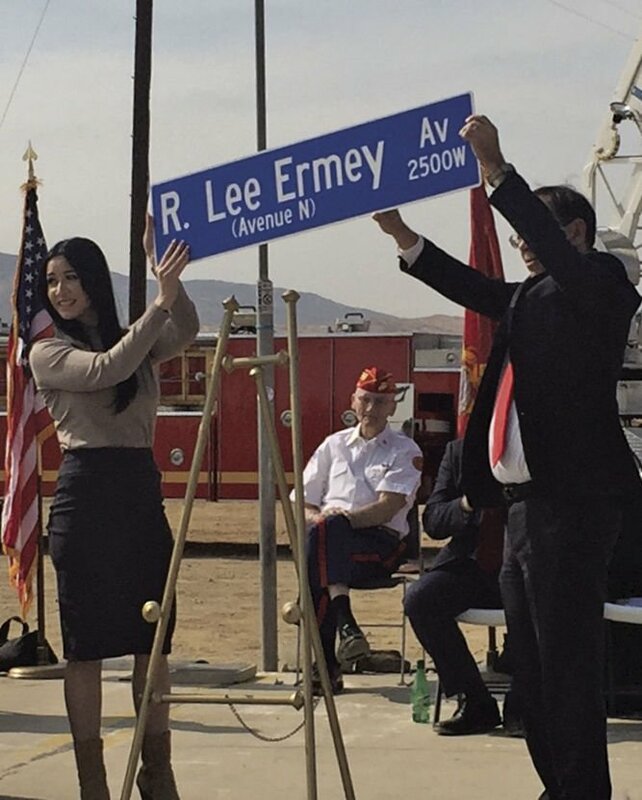 The master of cere­mo­nies was Ric Norris, who is working with a group trying to raise money for signs denoting R. Lee Ermey Boulevard, as well as to create a musical road that plays the first verse of the Marine Hymn in a half mile stretch of the road. The group has raised about 10% of the $150,000 it needs. Donations can be made at www.gunnyave.com.